Are you getting “Error 0xc004d307: The maximum allowed number of re-arms has been exceeded” error message while trying to convert a not genuine windows operating system to genuine? If YES then don’t worry as you can easily deal with this issue. This error message may appear when you run “SLMGR -REARM” command for more than three times. 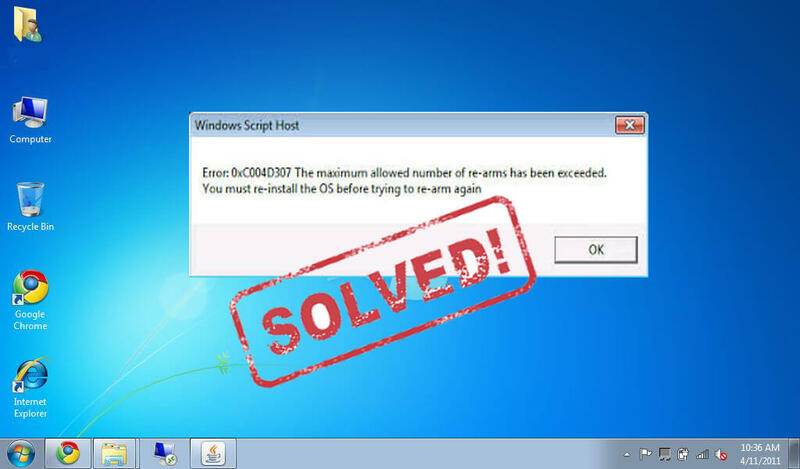 The command “SLMGR -REARM” is used to convert the trial version of Windows 7 to full version, and during the conversion process of not genuine windows to genuine windows, you may get the error 0xc004d307 when you have tried this command for more than three times. In this tutorial you will learn the different techniques to fix Error 0xc004d307 or the maximum number of rearms exceeded windows 7 or slmgr rearm not working after reboot “Error 0xc004d307: The maximum allowed number of re-arms has been exceeded”. As above discussed, while converting not genuine windows to genuine, you may receive this error message (Error 0xc004d307). You can’t run the SLMGR – REARM command more than three times and when the user exceeds the limit this error pops up. In order to get rid of this error message, you have to reinstall the OS (Operating System). But, if you want to remove Error 0xc004d307 without reinstalling OS then you can do it by following the given steps. But before applying the solutions lets know what happened when user run SLMGR -REARM command more than 3 times. When you execute the command SLMGR -REARM for more than 3 times then the value of “SkipRearm” registry key will turn to “0”. So, we have to change the “SkipRearm” registry key to “1”. To do this we have to find out the “SkipRearm” key using the registry editor window, the whole process is given below. Step 1: Open the run dialogue box, by pressing the “Windows + R” keys. After opening the run box, type “Regedit” and press the Enter key. This command will open up the Registry editor window. Step 2: Click on the arrow mark present along with “HKEY_LOCAL_MACHINE”. Step 3: Click on the arrow mark present along with “SOFTWARE”. Step 4: Click on the arrow mark present along with “Microsoft”. Step 5: Click on the arrow mark present along with “Windows NT”. Step 6: Click on the arrow mark present along with “CurrentVersion”. Step 8: Now, right click on the “SkipRearm” present in the right window. Step 9: Click on the “Modify” and here change the “Value Data” to “1”. Step 10: At last, reboot your computer. Now you can run the command SLMGR -REARM and convert your non-genuine Windows to a genuine operating system without any error message. After applying the above-given technique you can easily convert the trial version of Windows 7 to full version. But it is recommended to apply the above-discussed solution very carefully as a small mistake while operating over the Windows registry may affect your entire computer. If you don’t have the knowledge to operate over the registry keys then you should avoid this steps and contact with anyone who has experience in this skill. After converting the trial version of the Windows operating system to the full version, now it is recommended to scan your entire PC/Laptop with a professional PC Error Repair Tool. This is to deal with those errors that you can’t fix manually. Simply download, install and run this tool on your computer. It will automatically scan your entire system and fix several of the issues related to the registry database, DLL errors, driver confliction, system file integrity and more. And the most important part of this tool, you don’t need any professional experience to operate it as this software is completely automatic. Try the manual and automatic solutions to fix Error 0xc004d307 to minimize the re-arms. All these fixes will definitely help you resolve Error 0xc004d307. Top 7 Solutions to Fix Activation Error 0xc004f074 in Windows 7, 8 8.1, and Windows 10 !